How do you save a child you've only seen in your nightmares? 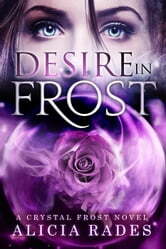 CRYSTAL FROST recently discovered she can see ghosts and predict the future, yet the mystery of Hope Ross's abduction still haunts her dreams. While traveling to Florida for Thanksgiving, Crystal's visions of Hope only grow stronger. She enlists the help of her soon-to-be step-cousin, Robin, a decision that complicates the entire picture--and her feelings. Can she figure out what happened to Hope and learn why Robin is so guarded, or will her newfound abilities fail her?